In this section you will find a complete selection of orthopedic cushions and pillows from the top manufacturers including Mabis-DMI, Essential, HealthSmart, LumbAir, Chiroflow and BodySport. We have everything from cervical pillows, donut cushions, neck rolls, lumbar rolls, wheelchair cushions. 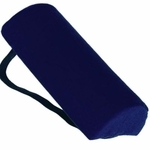 We even carry hard-to-find FootLevelers Chiropractic Pillows.